Shadow Blade: Reload has no time for the weak or the slow. It’s an action-platformer that demands you move at lightning speed, leaping from platforms, collecting items and dealing out ninja-themed death like a cracked whip. There’s a clock ticking away at the top of the screen, urging you to run faster, bounce off walls with lighter feet and reach the end of the level like a whisper moving at lightspeed. Originally developed for mobile devices (and Ouya – remember Ouya?) back in 2014, this little indie gem might love its sense of speed and momentum, but is a game all about ninjas, so stealth still has a part to play. Pulling off the best score and clocking the best time often requires you to kill enemies from behind before they see you or launch a well-timed shuriken to take out a ranged enemy ready to shoot you down. It only takes one hit to knock you back to a checkpoint, so knowing when to strike and when to move are the keys to success. As a 2.5D platformer in a similar vein to the likes of Assassin’s Creed Chronicles or Ori and the Blind Forest, Shadow Blade isn’t strictly a Metroidvania game – there is very much an optimum route to take across its 50 levels, but there are plenty of secrets to find for those that want to pull off the best score over the fastest time. 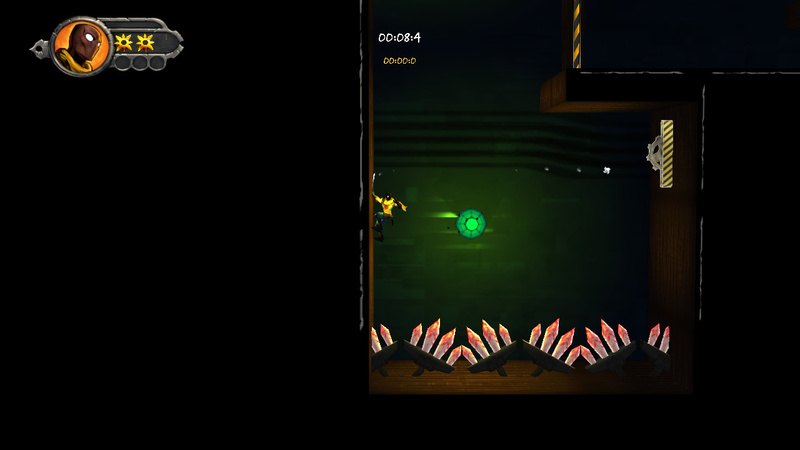 There are orbs to collect, often leading you in right direction, while each level has three glowing symbols to collect – most of which will require you to use your acrobatic skills to collect without dying. Checkpoints are usually well placed, so even if you mess up, a quick restart is usually a few seconds away. You have a basic attack that changes depending on whether you’re behind in front of an enemy, while shurikens can be used to deal with enemies at range. You can land on enemies and deliver a deadly blow, but linger too long in front of them and you’ll likely be flung back or into a nearby spike pit. 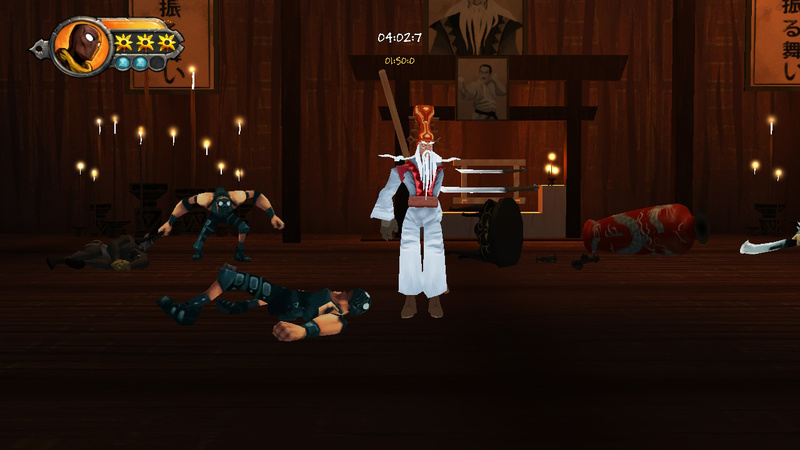 As you push through its story mode, you’ll eventually come across increasingly more challenging enemies. Some will fire homing rockets that require you to outrun them before attacking their origin, while others will call in extra foes if they’re alerted to your presence. On their own, each of these goons can be taken down swiftly, but when Shadow Blade starts mixing them together, things get very tasty. For anyone who’s played the likes of Strider, Guacamelee or Dead Cells, Shadow Blade’s sense of movement will be comfortably familiar. You can double-jump, dash (both along the ground to pass enemies and in mid-air) and slide down walls so you have all the basic movement skills you need to leap between walls and dash across gaps to access seemingly hard to reach secrets. That dash is invaluable, both as a means of evading enemy ranged fire and as a way of shaving seconds off your best times. There are a handful of bosses to take on, and while they’re not particularly memorable, they do present a way to mix up the speed and precision of the game’s normal levels by challenging you in new and unexpected ways. Much like its 50 levels, these boss battles are a ton of fun to play and will provide a serious and engaging challenge for those obsessed with speedrunning for the best possible times. However, all that speed and acrobatic movement does ultimately resign its stealth options to nothing more than timing your landings so you take out enemies from behind or above. 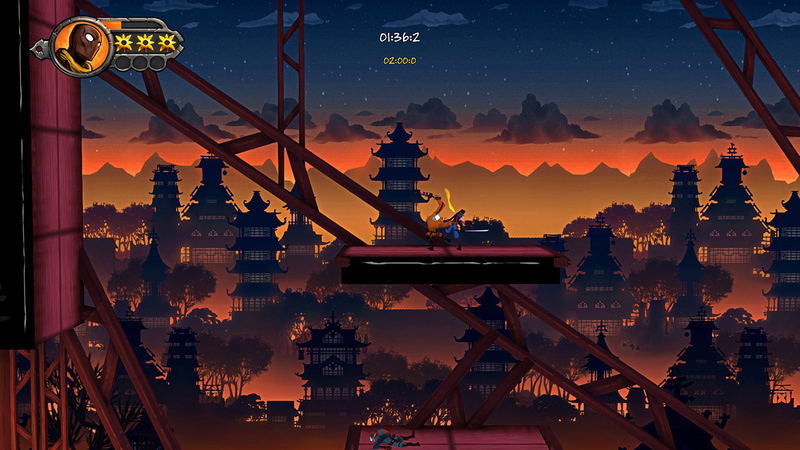 Alongside the story mode, there are 10 challenges to complete, each with their own unique combination of hazards and traps and a timer so speedrunners can push their ninja skills to the limit. You can also unlock new comic book panels every time you progress to a new set of levels, so there’s an extra collectable aspect if you really want to rinse this offering for all it’s worth. However, the Nintendo Switch version does not include the level editor introduced in the PC/PS4 version, despite having some of the gameplay features also introduced with these incarnations. It’s an odd feature to remove, especially as creating your own set of challenges and sharing them with friends would give this fast-paced platformer a far greater degree of replay value. The gap in quality between mobile games and console/PC releases is almost non-existent now, as is proved by the likes of Shadow Blade: Reload. As such it fits the portable nature of Nintendo Switch like a glove, with its short-yet-challenging levels offering a platforming experience that’s ideal for both short bursts of play and longer speedrunning sessions. The sound design helps create a rhythm to your progression through each level, and there’s plenty of secrets to find in each level, but the absence of the level editor included in the PC/PS4 port makes this version feel a little hollow by comparison.